Every time I walk past the Lush store on the promenade I'm reminded of our trip to Europe where I found my first Lush store. i take out my italian bread or wheat bread. i take out two slices or four if i'm really hungry. i set them on top of each other. i open the fridge and pull out the creamy peanut butter and strawberry preservatives jelly. next i go to the side drawer. open it & pull out a butter knife and spoon (it has to be the perfect size...not to big...not to small). then i open up the peanut butter and use the butter knife to get out a generous portion. i pick up the top piece of bread and spread the peanut butter all over it. and make sure its evenly distributed. then I set that piece to the side and pick up the perfect size spoon. open the strawberry preservatives jar and take out a nice generous portion of that...making sure i got enough chunks of strawberry. i start to spread it on the 2nd piece of bread making sure its evenly distributed. then i close everything up and put it all away. and then i put my two pieces of bread together and viola' the perfect pb&j sammich as been made. now i gotta think of what thing i do that always brings make a specific memory. what was the reaction? did u get the job? there's a certain smell of wet grass/morning sunshine that always make me think of a small town in italy (nerviano, i lived there). i think the way i make pb&j is super complicated too. probably because i'm have ocd. I can't think of any triggers right now. They're always spontaneous and random and I always forget about them immediately after it happens. Oh, wait...I thought of one. The song from the end credits of Moulin Rouge reminds me of my neighbor (and convicted murderer). Completely strange, but I was obsessed with that song at one point in my life and listened to it on repeat while I read a biography of him. Now it's tattooed in my brain. As for my pb&j, the type of bread doesn't matter, but I put peanut butter on both sides and then a healthy portion of (preferably) homemade strawberry jam on one of the sides. I've been told I'm a master pb&j maker. I think it's because the jam doesn't get soggy this way. Firstly, I adore this post. Secondly, every time I get to a certain room in the third dungeon of The Legend of Zelda, A Link to the Past, I think about when my brother was teasing me about how I was in the KKK (I was not.). And...I make a PBJ by getting out the crunchy peanut butter and strawberry jam, putting them on wheat bread (peanut butter first and then wiping the knife off on the second slice of bread before getting the jam), and then putting them together before biting in and smiling. All with a cool glass of milk. Gotta have milk. two slices of white bread lined up side by side. spread a thin thin THIN layer of creamy PB on each slice. spread a layer of grape jelly on each slice. eat each slice individually, open-face style. Hi, just found your blog - love it! I always put PB on both slices of bread so that the jelly doesn't leak through. I think I ate PB&J for lunch every day from K-8...and I still love it! I love your blog, you're so so cute! Thanks for making me laugh almost everyday! But, did you get the job at Jamba?!? I don't think I have any triggers like that, with me it seems I have to really stop and concentrate to remember things in the past. I guess I just live so much in the here and now, I don't want to say moment because then it sounds like I live recklessly. I always spread the jelly first. I prefer my PB&J's on white, something so simple and classic about it. 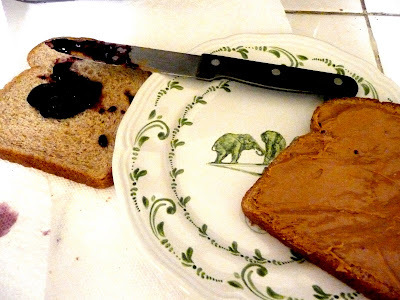 After I spread the jelly, I wipe off the jelly on the other piece of bread and then get the peanut butter; I spread that all around, put them together and enjoy! I eat PB&J a lot more in my life than I used to, because if I am making them for my kids I usually just make one for me to. That's so great. My sister has this odd, long-drawn out process of making PB&Js as well...I'm not even sure what exactly she does...but they always taste better than mine. Even with the same ingredients. so into the foam on the top of my milk! I have a photo of my late grandparents that was taken when they were still dating in the 1940's. Every time I look at it, it makes me smile not only because I love them and miss them, but because whenever we'd run across it with my Grandma, when she was alive, she would explain that it was a really hot day and her older sister, Ellen was chaperoning... that is why the top button on her blouse was unbuttoned... just in case we thought they were "necking" or something. LOL! I wish you could see how NOT.Even.Remotely.Close to "indecent" the unbuttoned blouse looks. Haha! I think she had a guilty conscious. I think they WERE necking and I love how incredibly cute and romantic that is after celebrating with them at their 60th wedding anniversary. I think it's hilarious that the Jamba Juice manager would ask such a random question! My sister just had an interview and was asked what weapon she would take into battle. Weird! Every time I eat chick peas I'm reminded of when I was in labour. I ate 1/2 a can of them while having contractions. Songs always bring back memories for me. I had to take a break before i started punching myself in the face. I can only hope that nothing from tonight will trigger the memory of either of these activities....like....commenting on your blog, oh nooo!!! I love a peanut butter and jelly sandwich! It always reminds me of elementary and junior high school because my Mom made me a lunch with a pb&j in it almost everyday. I still love them. Thanks for always having such fun things to read about. I always find potato chips to put in between my pb&j! I love the crunch! I was just reading back all your old posts and i came across this one. I love your blog so much! As for PB+J, i'm from Scotland, UK so i have never had a PB+J sandwich, believe it or not. Btw, this might sound stupid but is your jelly, my jam? Cause our jelly is the wobbly stuff you have with ice-cream and what we would put on a sandwich is jam. And we dont really eat peanut butter over here, i might try it sometime though, sounds interesting. Glad you got the job!